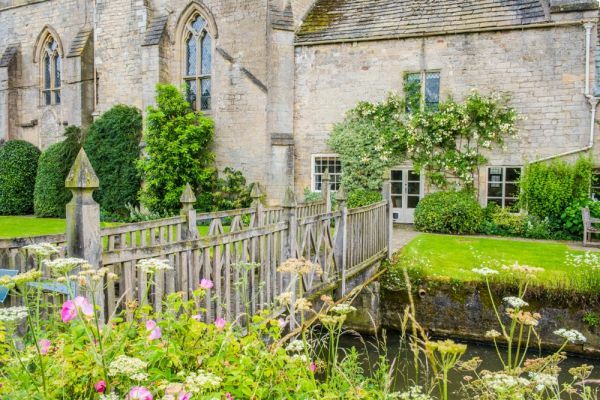 A relatively unknown historic treasure, Markenfield Hall is a marvellous moated manor house, dating back to the late 13th century and set in attractive countryside not far from Fountains Abbey. 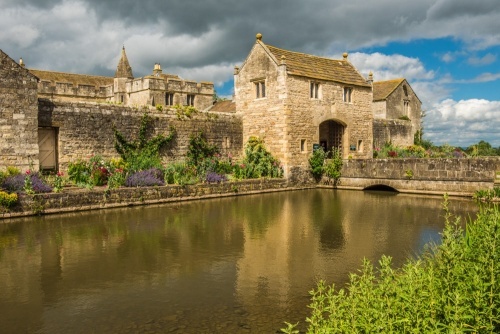 The bulk of the hall was built in 1310 and it is probably the most complete medium sized medieval manor house in England. The Hall is remarkably unchanged from its inception, and would probably be readily recognized by its 14th-century inhabitants. The oldest part of the Hall dates to around 1250. In 1310 Canon John de Markenfield, Chancellor of the Exchequer under Edward II, received a license to crenellate from the king, and expanded the earlier manor to its current form. History is not kind to Canon de Markenfield, who has been described as a bully and a kidnapper. He certainly had a controversial career in the church, and was excommunicated by the Pope on at least one occasion. 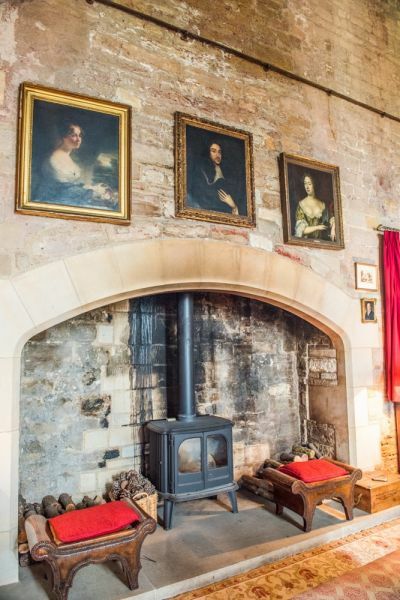 The history of Markenfield Hall is intertwined with the abortive Rising of the North in 1569, which ruined the fortunes of the de Markenfield family. The Rising attempted to roll back the tide of the Protestant religion, depose Elizabeth I and replace her with Mary, Queen of Scots. Sir Thomas de Markenfield was one of the main instigators of the plot, and on 20 November 1569, a large contingent of rebels met in the Great Courtyard at Markenfield Hall. They heard Mass in the chapel before setting out on their ultimately fruitless attempt to overthrow the queen. When the Rising failed, Sir Thomas and his family were forced to flee abroad, eventually settling in Brussels, where Sir Thomas died in abject poverty. The Markenfield house and estate was seized by the crown and the Hall was leased as a farmhouse. In 1761 the 1st Lord Grantley, a direct descendant of the de Markenfields, purchased the manor. The Hall is still owned by the Grantleys, so in a sense, you could say that the same family has owned the Hall for most of its long history, albeit with a very long gap. The Hall consists of a Great Hall and Chapel, forming an L-shape about an inner courtyard. A further, less impressive range of buildings stands beside the hall and was probably used as a stable and servant quarters. It is fascinating to study the estate map in the Undercroft. The estate boundary of Markenfield has remained unaltered for 500 years. It is, uniquely in England, the boundary of the farm, the civil parish, and the ecclesiastical parish. The parish has a total population of just 6 inhabitants. The history of Markenfield was closely tied to Fountains Abbey, just a few miles away. Markenfield is an Ecclesiastical Peculiar, meaning that it is outside the control of the Bishop of Ripon. 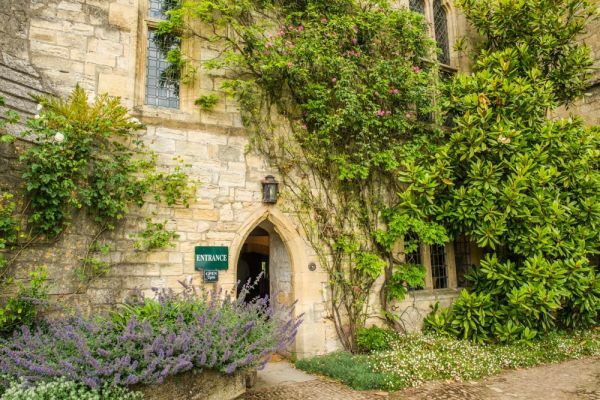 You enter Markenfield Hall through an arched doorway into the Undercroft, built in 1310. You can still see traces of the original 14th-century vaulting, especially in the adjoining utility room. The undercroft was originally used for storing food and wine, alongside weapons and foodstuffs paid as rent 'in kind'. One small chamber was used as the chequer, where the Exchequer was responsible for keeping track of stored items as they were moved in and out. Most of the Undercroft vaulting was removed in 1570 when the house was transformed from the De Markenfield family residence into a tenanted farmhouse. 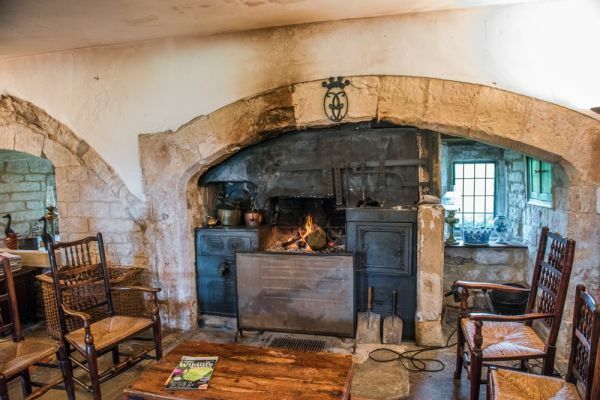 The large undercroft chamber became the farmhouse kitchen, and the fireplace in the great hall, directly above the undercroft, was disassembled piece by piece and rebuilt in the kitchen where you can see it today. Immediately to the left of the doorway arch is one of the most interesting historical lavatories in England; a small chamber that once served as a temporary gaol cell. Look for slots in the walls used to insert planks of wood to form stocks, so that prisoners could be held for several days before being moved to more permanent incarceration. In the early 14th century John de Markenfield, builder of Markenfield Hall, was summoned to appear before the Pope on the charge that he so terrified Thomas de Ceccano, a Papal Chaplain, that de Ceccano resigned his post. De Markenfield was excommunicated for his terrifying act, but what could it have been? Perhaps he imprisoned the Chaplain in this small cell? Immediately off the large undercroft chamber is the Utility Room, which retains its original vaulted ceiling. This is part of the oldest section of the Hall, built around 1230. Above the undercroft is the spacious Great Hall, originally reached by an external stair. Much of the hall is Victorian but the roots of the chamber go back to 1280. The walls are lined with bookshelves and large windows with Gothic tracery light the interior. On one wall is a royal charter granted by George III and nearby is a display on the Grantley family memorial window in Ripon Cathedral. The window was commissioned in 1840 by the 3rd Lord Grantley and executed by Thomas Willament, the official heraldic artist to George VIV and artist in stained glass to Queen Victoria. 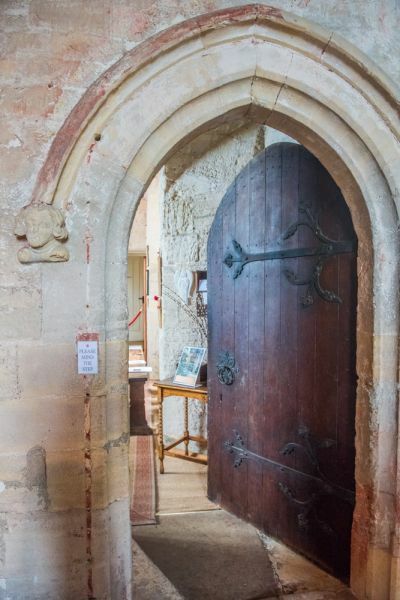 Just off the Great Hall is this delightful medieval chapel, built in 1310 by Canon John de Markenfield. Services were held by a resident chaplain who probably also served as chaplain for the Markenfield Chantry Chapel in Ripon Cathedral. 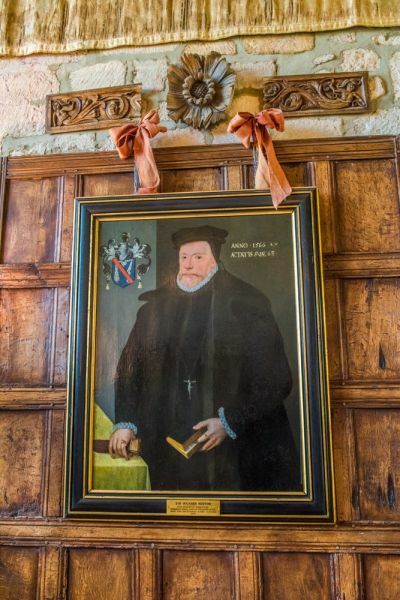 A squint in the far chapel wall allowed Canon Markenfield to see and hear morning Mass while keeping warm at a fireplace in his private chambers. 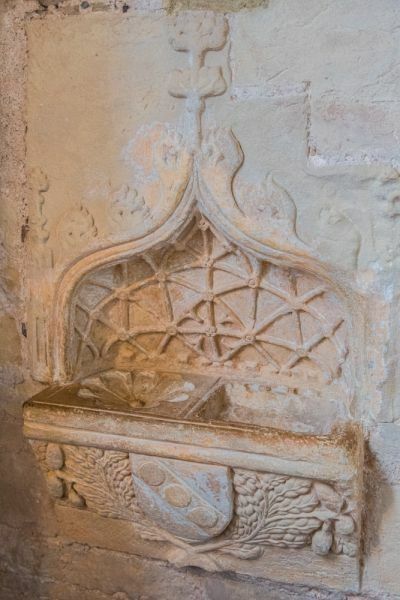 Beside the altar is an exquisitely carved double-piscina, decorated with stunningly beautiful tracery and oak leaves surrounding the Markenfield coat of arms. On the nearby altar is a fragment of a medieval statue found in the moat. It is thought to be part of a statue of a devotional child-saint. The Chapel played a part in the religious rebellion known as The Rising of the North in 1569. Sir Thomas de Markenfield was one of the Rising's leaders., along with his uncle Sir Richard Norton of Norton Conyers. The leaders of the revolt heard Mass in the Chapel here before setting out on their mission to dethrone Elizabeth I and replace her with the Catholic Mary, Queen of Scots. Unfortunately for the Rising, 'when it came to actual fighting its leader' passion was not matched by military competence'. Royal soldiers surrounded the rebels and Sir Thomas and his uncle were forced to flee abroad. Sir Thomas never returned home and died in extreme poverty in Brussels. An annual Mass is held in the Chapel for Sir Thomas and his family. By the 19th century the Chapel was being used as a grain store by tenant farmers. The Chapel was restored in 1981 and now holds regular Anglican and Catholic services. The drive to Markenfield Hall is 1 mile south of Ripon on the A61. It is well signposted and very easy to find. 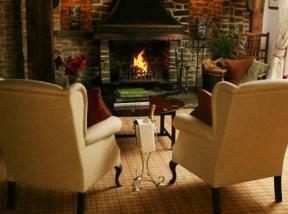 The drive takes you deep into the countryside, where you approach the Hall through a cluster of farm buildings. There is a large parking area just beside the moat surrounding the Hall. I loved a little sign beside the gate to the parking area that read 'Please do not fall into the moat'. 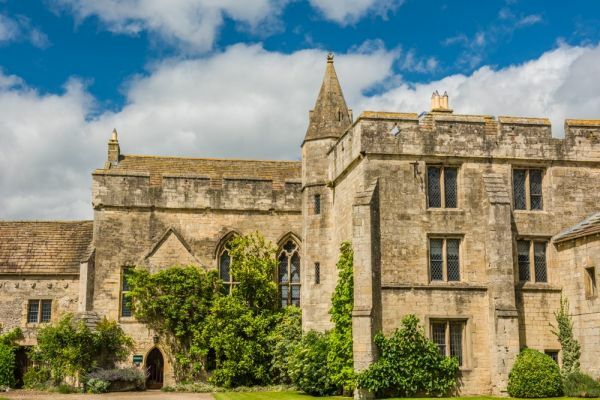 Markenfield Hall is one of the most enjoyable historic houses to visit in England. 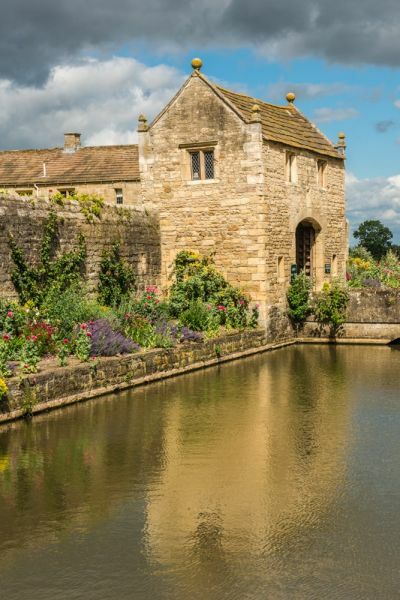 It is remarkably unchanged and to see the gatehouse rising above the moat is to be transported back in time. The house deserves to be much better known. Location: 1 mile south of Ripon on the A61.